Fourth Row Center: Film Writings by Jason Bailey: On DVD: "Gran Torino"
From a conventional storytelling standpoint, Gran Torino is something of a disaster. It’s almost entirely predictable, numerous dialogue scenes ring noticeably false, the tone is all over the place, and it keeps stopping for scenes that go nowhere. Its performances are wildly inconsistent, and it’s a good fifteen minutes too long. But it still works somehow, mostly due to the skill and presence of Clint Eastwood as its director and leading actor. The script is a mess, but the considerable iconographical baggage that Eastwood brings to the table does a great deal to spackle over the story’s many holes and false notes. He stars as Walt Kowalski, a Korean War vet and lifetime Ford worker whose wife dies just before the story begins. He doesn’t get along with his grown kids and their families (the quickie portrait of a disconnected family is broad but convincing), so he’s fairly content to live out the rest of his days drinking beer on his porch and polishing his prized possession, a 1972 Gran Torino. But the world has changed around Walt—particularly the world around his immaculately-groomed lawn. He’s about the only white face remaining in his neighborhood, which is now mostly inhabited by Hmong families (a fact that allows him to keep trotting out his leftover xenophobic slurs). The Lor family next door has two teenage kids: daughter Sue (Ahney Her) and son Thao (Bee Vang). Thao is an introverted kid who’s getting pressured by their cousin (Doua Moua) to join his Hmong gang; the initiation they device for the reluctant kid is to boost Walt’s prized Torino. Walt catches Thao in the act; he runs for the hills, and when he refuses to do another initiation, a brawl breaks out in front of their home that creeps over to Walt’s place. 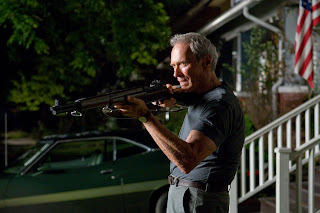 This is the movie’s first big crowd-pleaser moment: as Thao and his antagonists scrap and push all over Walt’s perfect green grass, the camera tilts up to Eastwood, leveling a rifle in tight close-up, as he growls, “Get off my lawn.” The audience eats it up, of course—it’s Dirty Harry meets Mr. Wilson. There’s no question whether it gets a laugh (it does), but is Eastwood playing it for one? Later, Sue is out for a stroll with an ineffectual caricature of a white b-boy when they’re confronted by three tough black guys who start talking dirty and man-handling her. Walt, of course, happens by, and ends up saving Sue by pulling a gun on the black kids (and throwing some slurs their way too). That marginally troublesome (but indubitably well-received) scene sums up the trouble with the Walt character: the script wants to have it both ways with him. They make him racist, but not too racist (he calls them “spades” but not “niggers”), and when they set him up in situations like this one and the scene on the lawn, we can dig his tough-guy encounters and forgive his casual racism (some audiences might even enjoy it a little) because these guys have it coming and besides, we’ve seen enough movies to know he’ll be a good guy by the end of the picture. The script also hamstrings Eastwood, as a director, with a number of scenes that bog down the momentum. There’s a running subplot with a young priest (Christopher Carley) who was close with Walt’s late wife; his scenes are too numerous and mostly unconvincing (their conversation in a bar about life and death plays like a first draft), and Carley’s woefully inadequate performance doesn’t help matters any. The character has two good scenes near the end, but they aren’t worth all the bad ones that precede them. The scenes with the gang members are, admittedly, more convincing than you’d expect from a director who’s pushing 80, but they’re still a touch forced (and Eastwood clearly relied on too much improvisation by actors who weren’t up to the task). A later scene in which Walt, who has taken Thao under his wing, takes the young man to his neighborhood barbershop to learn how to relate with other men (“Now you’re gonna learn how guys talk,” he informs the boy) is a “movie scene,” disconnected from anything resembling reality and only good for cheap, easy laughs. Ahney Her is an unaffected, natural performer, and a key scene where she brings Walt over to a family gathering is charming and a little heartbreaking. Some of Vang’s line readings are a little stilted, and a scene towards the end where he’s calling out for Walt needed a much quicker cut (you start to see him acting), but he has an interesting, low-key quality. Eastwood’s performance is a little uneven; he spends most of the first act communicating primarily in guttural grunts, his face a glowering, bitter mask of sheer contempt for everyone around him. He’s also required to talk to himself too frequently (this is the handiwork of a lazy screenwriter). Midway through, a scene in which his children propose putting him into a home climaxes with a big push-in to his fuming face; it’s a moment of bug-eyed overacting that none of his other directors would have ever left in. But once it gets into the second hour, his considerable strength and ability to hold the screen comes through. The broad strokes of the story may be obvious, but Eastwood’s playing and direction are mostly straight-forward and effective. And there’s no question he knows how to work an audience over—when he picks up his gun or beats the hell out of a gang punk, it does get a rise out of us. And when the people Walt comes to care for are wronged, our blood boils with his, culminating in a scene of exploding rage that shows the kind of passion which sometimes didn’t make it into his earlier movies. That intense emotion lends some real power to the genuinely unexpected conclusion. In those moments, Gran Torino plays. But they don’t negate the very real difficulties elsewhere in the film. Gran Torino became Eastwood’s biggest box office hit to date (without inflation adjustment, anyway) and was considered by many filmgoers and critics as superior to his other fall 2008 release, Changeling—which is befuddling, as Changeling is the far better picture. But Gran Torino certainly has its moments, and its simple, businesslike storytelling undoubtedly resonates—even if Eastwood himself has been making far more complex and challenging films in recent years. "Gran Torino" hits DVD on Tuesday, June 9th. Here's my review of "Clint Eastwood: American Icon Collection", a four-movie set of his 60s and 70s work, released earlier this year.